In today’s digital economy, the importance of being found online via organic search is becoming more and more important. Pay-per-click advertising works, but it represents less than 15% of clicks on a page of search results. And if your business doesn’t show up on the all-powerful page 1, how might you expect to stake a claim on that prime real estate? Incline Media is a new paradigm optimization firm that has real answers, so read on and get a handle on some best practices that will help any online presence become more visible, organically. Content is king – cliché, or real life? We’ve all heard the phrase, “content is king,” right? There’s a reason it’s a cliché: because content really is king! And one of the easiest and most valuable ways to generate content is blogging. I’m sure you’ve also heard people throw around the term “content marketing;” they’re essentially talking about blogging. You don’t have to be an internet expert to blog – most websites even have a blog section already built into the structure. So if you have a website, you can easily add a blog; and if you don’t, then starting a blog is a piece of cake. You may have excused yourself from blogging because you think you have nothing to say. Well, think again! Whatever your point of focus is – whether it’s your job, your hobby, your kids, your car, and on and on – you can write about it. If it’s your focal point, then there are sure to be thousands of other people who are also interested in that subject, and would love to know what you have to say about it. And if it’s your business you’re wanting to promote, who would know more on that subject than you? Content really is king, and blogging is your key to the kingdom – so start blogging! Cut and paste: genius, or evil? Okay, it’s evil. If you’re currently maintaining a blog or a website, and one of your common practices is to find good content elsewhere, whether it’s yours or not, STOP NOW! Since the web thrives on new, fresh content, it follows that what you need to be posting is new fresh content. You get Google “credit” for fresh content, but not for content that’s already been posted anywhere else on the web. In fact, you can get “dinged” for posting copied content. Google crawls the entire internet all the time, so they know if content is fresh or not – you can’t trick them! Great, fresh content is hard to do, but it’s worth it. And since the search engine algorithms are built to provide searchers with the best answers to their questions, amazing content that’s fresh and valuable to the reader is what will propel you to that front page the quickest, and keep you there the longest. Never, under any circumstance, cut and paste content. Ever. Does consistency really matter? Yes. Yes it does. I’ve seen it a hundred times: a client gets all fired up about their new website or blog, and decides they’re going to absolutely kill it. So they start writing blogs everyday, maybe even twice a day, shooting cool artistic pictures, scripting and shooting videos, and more. Then the realization hits: I still have to run my business too! So they burn it at both ends for a while (more than they already did), only to get to a point where they completely burn out and stop cold. Here’s my point: don’t do that. Even though content is king – and more content is more king 🙂 – your posting needs to be consistent and sustainable. Think of Google as a stray dog. The more consistently you put food out, the more consistently he’ll show up. Skip a few days and he’ll move on completely. You want Google to crawl your site regularly so they rank your new content as soon as you post it. So be consistent! Figure out what frequency is sustainable for you, and settle into a rhythm. It’s better to start out slow and increase than to start out fast and taper off. Underscores vs. Hyphens – who cares? Google, that’s who. This is a very specific tiny issue, but it can have huge repercussions. For example, a client from our past (a large car company whom we won’t name, but their initials are BMW) paid a huge sum of money to another firm to have their entire web presence rebuilt and redesigned. Someone in the chain made the mistake of naming all the assets using underscores instead of hyphens as word separators, which is a coder thing, but not a web thing. All of their rankings plummeted, and because of the scope of the project, they had to spend millions more to fix the problem. Google and all other search engines see a hyphen as a space, but they see an underscore as a nonsense character. So Best-Barbecue-in-Dallas looks like 4 words, but Best_Barbecue_in_Dallas looks like one long word that means absolutely nothing to search engine algorithms. It’s a simple mistake that can literally cost millions. Check your nomenclature – pictures, videos, PDFS – and make sure you’ve used hyphens in the name instead of underscores as separators. Fix it, and leave that habit behind. Bad title composition can lead to decomposition. Of your rankings. Just remember this: titles are the main access point to your content, so they should reflect, as accurately as possible, the topic of your post; while at the same time being informative, attractive to your audience, and hooky enough to make them pay attention! In other words, a great title is worth expending a little extra brain power. Remember, search engines are looking to provide the best answers to people’s questions, so the best title would be an actual keyword (search term), or at least contain your keyword. For example, if your article is about the health attributes of an avocado, a great title might be “Are Avocados Healthy” or “12 Benefits of Avocados,” not “Avocados Schmavocados – Who Really Cares?” In other words, think about your potential reader at all times – including when you write your titles! Stick with me a minute longer here, and we’ll talk about keywords on down the page. When you write your title, ask yourself if it’s something anybody would type into a search. If not, then adjust it a little to something that’s still accurate and attractive, but is more like something someone might search. Image really does matter, in this case. The importance of images is not stressed as much as it used to be, but they’re still important; so if you’re not using images in your posts, you’re already a couple of generations behind. When it comes to ranking in searches, success happens because of a combination of many small things, one of which is images – fresh, unused images, named correctly for search. Note: if you subscribe to a service for marketing images, like Shutterstock or iStockPhoto, those are not fresh, unused photos! You can still use them, you just need to edit them and rename them. Or even better, shoot your own pictures! •Edit the pic. Filter, crop, etc, but change something; even if you only change 1 pixel! Video will soon dominate the internet. Google says that by 2020, 80% of all consumed content on the web will be video. That’s a pretty staggering figure, and you can look at the numbers yourself and see that it’s already happening. It’s no secret, and no surprise. The surprising statistic, however, is how few otherwise savvy business owners/operators have failed to even dip a toe into the pool of video. It doesn’t take a major production, or a team of writers, or even have to cost anything. You just have to get a little bit creative, and not be afraid to take what feels like a risk (but isn’t). Most of you have a smart phone that shoots better video than many professional cameras did even a few years ago, so use it! Shoot some behind-the-scenes stuff; interview a satisfied customer, whatever – just do some video! Because of the escalation of video, Google (and all other search engines) gives huge ranking power to video; which is why we built our entire platform around it! More about that later, but in the meantime, give it a little thought. It’s easier than you think. Grab your phone and shoot a general overview video about your business, and post it. Don’t worry about creating some huge, impressive, epic video; people love real life. Show them that actual people with real personalities are behind your business. If you aren’t using headings in your posts, you’re missing out on one of the easiest ways to please the search engines. Google loves headings, which also happen to be very effective way to break up your written content into “scannable” chunks. Some people read entire articles, but the vast majority just scan for the particular information for which they were initially searching. So help them out a little: break up your content into easily scanned chunks, with headings! We’re talking about H1, H2, etc. headings here. When you add appropriate headings to your content, it gives readers a roadmap they can follow directly to the information they were searching for, which means you have succeeded; and, in turn, so have they! At the top of your post, use one (and only one) H1 heading; then use H2 and H3 headings for subsequent paragraphs down the page. BONUS TIP: use your main keyword in your H1 heading at the top, and use smaller but related keywords in H2 headings to follow. Name calling is not always bad. We’ve touched on this earlier, but for the sake of clarity – names matter! Any asset you incorporate into your online presence; whether it’s an image, a video, a PDF, or even an audio clip, take advantage of the opportunity and give it a name that will help it get found in a search. For instance: if you’re posting a stock photo, don’t leave it named however it came to you – nobody searches for “avocado143229.jpg.” But they might search for “avocado health benefits;” so name it “avocado-health-benefits.jpg” instead. Such a simple matter, but so important. Think about every asset you post, and give it a good name. And remember to use hyphens! Find or shoot a picture that illustrates the topic of the entire post, and feature it as the featured image, which usually means it shows up at the top of your post. Some themes handle the “featured image” display better than others, so if yours does something weird, then leave it alone (or switch to a better theme). But the featured image slot is one more little tweak that might be just the difference to push you up to a higher ranking status. If you have only one picture, put it in the featured image slot. If you have several, place them appropriately; but be sure and utilize the featured image function in every post. 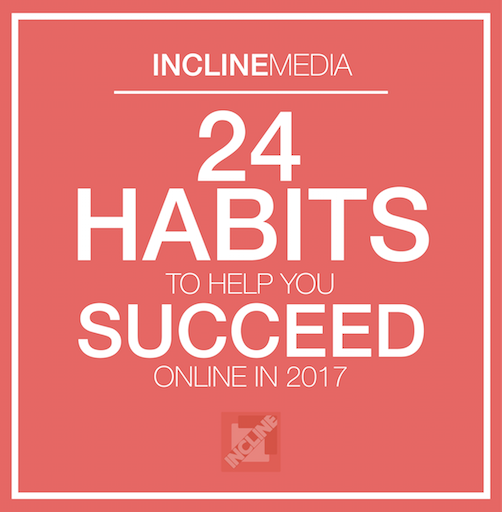 GET THE REST OF THE 24 HABITS BELOW! If you’d like to get the full PDF file with all 24 habits to help you succeed (i.e. get found) online, please fill out the form below. It’s not a big deal – we don’t spam anybody or send unwanted emails, or sell our list. We’d just love to have a record of who is interested in this stuff, because we think it’s cool, and we’re glad you do too!